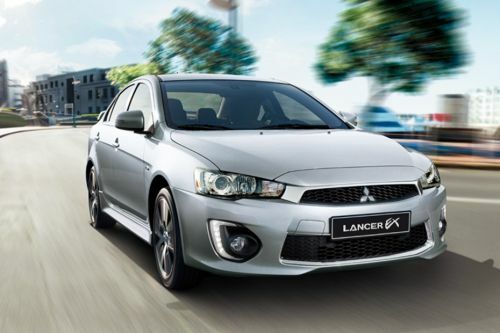 The Lancer is a compact sedan that has been an integral part of Mitsubishi’s lineup for a while now. The car can comfortably accommodate five adults and has a reasonably spacious boot area. However, despite all its attributes, this sedan is many times overlooked by buyers because of its old looks screaming for attention. In the UAE market, the Lancer EX sells is threatened by the likes of Honda City and Toyota Corolla. Still, several factors make it a good buy one of which is its affordable price tag of AED 41,895 (base variant price). All the three Lancer EX trim - the GT, GLS, and GLX are powered by a 2.0-litre 4-cylinder DOHC MIVEC ECI-MULTI mill that churns out a maximum power of 148 PS. The fuel efficiency figures are also good at 15 kmph. Supporting its worth in the modern times are safety and cabin feature it comes packed with. The sedan even secured a 5-star safety rating in 2015 and is loaded with features like seven airbags, rear-view camera, ABS, and more. Have a question on Lancer EX? Lancer EX is available in 7 different colors - Red Metallic, Silver Metallic, Black Mica, Lightning Blue Metallic, Sterling Silver, Titanium Grey Metallic and White Solid. Watch latest video reviews of Mitsubishi Lancer EX to know about its interiors, exteriors, performance, mileage and more. The Mitsubishi Lancer has been with us for a very long time, since its launch in 2008. Harkening back to the Evolution X, it promised to be a fun commuter at an affordable price. 10 years have passed since then. The car industry has gone through many remarkable changes in this time. But the same cannot be said about the Lancer. Despite many improvements, the car has remained mostly the same. The improvements have, however, kept the car somewhat competitive against its rivals like the Subaru Impreza and the Nissan Sentra. But on the whole, the car desperately needs a replacement, of which there seems to be none on the horizon. That still does not mean that it is not worth having a look at. Only recently, it received a cosmetic facelift. It now also comes with some more contemporary features that keep it up to date with its contemporaries. The age though really starts to show once we move inside. It’s a grey and black sea of hard plastics. That hallmark of bad quality – blank switches – makes its presence known one too many times. The cabin tends to get noisy. Rear legroom is compromised by the transmission tunnel protruding through the floor. This limits the already narrow cabin space inside. Same goes for boot space. Mitsubishi redesigned the hinges on the boot creating some more space. However, at 400 liters it is not in the same league as some modern cars. Thankfully the rear seats fold down flat creating more space. The middle of the road GLS variant otherwise, is pleasantly equipped. The steering wheel has audio and cruise control functionality. The infotainment system uses a 7-inch touchscreen which is a pleasant surprise at this price range. It also comes equipped with Bluetooth, USB and surprisingly - navigation. However, it does not stop there. It also gets automatic air conditioning and a reverse camera. This variant gets a 6 speaker sound system while the GT gets a booming 700W 9 speaker Rockford Fosberg sound system. These features make the Lancer the most well-equipped car in its engine segment. What it does miss out on though is a telescopic steering wheel. No height adjustability for the steering wheel is plain idiotic. The Lancer needed to appeal to its buyers by way of its bigger brother, the Evolution. But off late Mitsubishi has decided that the styling needs to be on the more mature side. The dimensions have remained more or less the same, at 4570 (L) x 1760 (W) x 1505 (H) mm. The long tapering bonnet ends in the front grille now adorned with a chrome surround. Flanking that are the narrow headlamps. The bumper is redesigned and has fog lamps surrounded by LED DRLs. The rear looks clean despite the huge wing on the GT. The side is almost featureless with 16-inch diamond cut wheels wearing 205/60R16 tires on the cheaper variants and 18-inch ones shorn with 215/45R18 tires on the GT. All these touches cannot hide the fact that the Lancer is an old and dated design compared to nearly everything else on the road. And yet it will still look distinctive in any parking lot. Despite having a sporty aspirations courtesy to Evo, the Lancer’s suspension is on the softer side. This, however, gives it some body roll while trying to take a corner too hard. The worst components, however, are the seats themselves. These provide very little support and will have you constantly shifting to readjust your position. There are two engine options provided here. There is the 2.0-litre 4-cylinder MIVES engine producing maximum power of 150 PS at 6000 rpm and peak torque of 197 Nm at 4200 rpm. The smaller 1.6-litre engine produces maximum power of 117 PS at 6000 rpm and peak torque of 154 Nm at 4000 rpm. The 2.0-litre engine is mated to a CVT that comes with a sports mode and is available across all the three variants – the GT, the GTS and the GLX. The smaller engine mated to the 4-speed automatic or the 5-speed manual is sadly not an option for the top of the line GT variant. Frankly, the missing manual option for the 2.0-litre engine is a damn shame. Performance is decent with the rev-happy and eager engine allowing the car to reach 100 kmph from standstill in little over 13 seconds. At this price point, especially for the 1.6, mileage has to be a high priority. And the Lancer GLS, with the manual, easily delivers 9 kmpl in city conditions and 16-18 kmpl on Highways. The Lancer also misses out on a lot of modern safety features that are now becoming standard in modern cars. Even ABS with EBD is only present in the GT variant. It is also the only variant to get airbags for the front passenger. Front side and knee airbags are optional extras. The rear only gets two seatbelts with the third being an optional extra. But probably that is expected for a car that starts from the low price of AED 42900 for the base model. great positive for us since we are a family who loves taking road trips. What is the price of Mitsubishi Lancer EX? On road prices of Mitsubishi Lancer EX in starts from AED51,500 for base variant GLX, while the top spec variant GT costs at AED66,900 . What are the colors options available in Mitsubishi Lancer EX? Mitsubishi Lancer - Is it a pick or skip? Mitsubishi Lancer variants explained: Which one to buy?